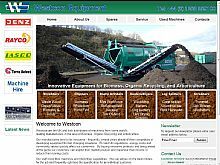 Westcon Equipment are distributors of equipment and machinery for Biomass, Organic recycling and Arboriculture across the UK and Ireland. Westcon can give advice on the best machinery and models for a job and give advice for each customers individual specifications and requirements. Westcon Equipment specialise in the distribution of equipment and offer after sales services, technical advice and spare parts. The full range of equipment is detailed on the website as well as used machines for sale. Westcon Equipment also offer mobile recycling equipment hire. High quality machines, kept in tip top condition that you can hire for days, weeks or months depending on your requirements. Westcon offer shredder hire, screener hire, and windsifter sorting equipment hire with full operator training as part of your contract. Contact Westcon Equipment with your requirements.